Sembach, a village in the Palatinate, Germany (coordinates: 49.513611°, 7.860556° [49° 30′ 49″ N, 7° 51′ 38″ E)], not far from Kaiserslautern, since the end of the 17th century the seat of a Mennonite congregation, with a membership in 1957 of some 250 baptized members; most of the families live in the villages and on the farms around Sembach: Wartenberg-Rohrbach, Mehlingen-Neukirchen, Enkenbach, Neuhemsbach, Langmeil, Potzbach, Schmitterhof, Otterberg, Münchhof, Randeckerhof, and Pfrimmerhof. The original families of the congregation — Krehbiel, Eymann, Eichelberger, Würtz, Schnebele, Beutler, Latschar, Kinzinger, Höfli — emigrated from the Emmental, Switzerland, in 1660-1710. Religious services were held in private homes in Sembach, Wartenberg, Fischbach, and Diemerstein until 1777, when the church was built. The first preacher was Ulrich Trüssel of Sumiswald, who was imprisoned in Bern in 1710 and came to the Palatinate in 1711. He was succeeded in 1760 by Johannes Krehbiel of Wartenberg, who saw the erection of the church, dedicated in 1778 by Jakob Galle, Erbesbüdesheim; substantial financial assistance was given by the Mennonites of Krefeld and the Netherlands. Among the more prominent elders and lay preachers were Heinrich Würtz, Johannes Eymann, and Peter Eymann. In 1832 Johannes Risser, of Friedelsheim, became the pastor, and under his ministry the congregation experienced inward and outward strengthening. In 1842 a parsonage was built, in 1853 the church was substantially enlarged, and in 1859 a constitution was adopted. The church records begun by Risser in 1832 and kept until his death in 1864 contain much that is of interest and value for the history of the South German Mennonites, besides the record of baptisms, births, marriages, and deaths in the congregation. The congregation continued to develop along the lines established by Risser under the succeeding preachers, Johannes van der Smissen 1869-79 and Samuel Blickensdörfer 1879-99. Services were held every Sunday, and communion twice a year. Baptism was administered on the first Sunday in September. In 1892 the congregation was incorporated. Among the chairmen (Vorsteher) of the congregation Jakob Krehbiel was outstanding and left a series of valuable diaries. In 1900-29 Matthias Pohl was the preacher in Sembach; he was noted far beyond his congregation as a speaker and writer. He vigorously countered many a symptom of decline in the congregation. In 1904 the congregation joined the Vereinigung der Mennonitengemeinden im Deutschen Reich. The congregation declined in membership through marriage with persons of other creeds. Consciousness of membership in a brotherhood seems to be disappearing in many Mennonite families. In 1887 the baptized membership numbered about 400, in 1940 only about 110. Hugo Scheffler, a native of West Prussia, served as minister of the Sembach congregation 1929-35. In 1935 Gerhard Hein of Russia took charge of this congregation with that at Altleiningen as a subsidiary, serving until October 1938. 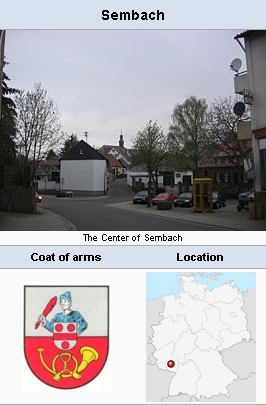 World War II left Sembach relatively undamaged. In 1948 an influx of about 100 Mennonite refugees from West Prussia strengthened it. In 1948, with the aid of the American Mennonites they rebuilt a dilapidated barn connected with the parsonage into a hall for the youth of the congregation, which was dedicated on 19 December 1948. Hege, Christian and Christian Neff. Mennonitisches Lexikon, 4 vols. Frankfurt & Weierhof: Hege; Karlsruhe: Schneider, 1913-1967: v. IV, 150-151. Hein, Gerhard and Matthias Pohl. "Beitrage zur Familiengeschichte der pfalzisch-hessischen Mcnnonitengemeinden: Geschichtliches aus der Gemeinde Sembach." (Pohl), and "Ein Kirchenbuch gibt Auskunft." (Hein), Mennonitischer Gemeinde-Kalender (1939): 86-121. Hoop Scheffer, Jacob Gijsbert de. Inventaris der Archiefstukken berustende bij de Vereenigde Doopsgezinde Gemeente to Amsterdam, 2 vols. Amsterdam: Uitgegeven en ten geschenke aangeboden door den Kerkeraad dier Gemeente, 1883-1884: v. I, 1472, 15431; v. 2, 2857-59. Hein, Gerhard. "Sembach (Rheinland-Pfalz, Germany)." Global Anabaptist Mennonite Encyclopedia Online. 1959. Web. 25 Apr 2019. http://gameo.org/index.php?title=Sembach_(Rheinland-Pfalz,_Germany)&oldid=155812. Hein, Gerhard. (1959). Sembach (Rheinland-Pfalz, Germany). Global Anabaptist Mennonite Encyclopedia Online. Retrieved 25 April 2019, from http://gameo.org/index.php?title=Sembach_(Rheinland-Pfalz,_Germany)&oldid=155812. Adapted by permission of Herald Press, Harrisonburg, Virginia, from Mennonite Encyclopedia, Vol. 4, pp. 498-499. All rights reserved. This page was last modified on 21 November 2017, at 20:32.